On August 22-26, 2018, “The solidary and rebellious summer university of citizens and social movements” will take place in Grenoble, France. 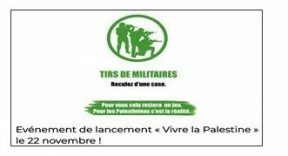 The summer institute is organized by 70 organizations, including many that support politicized anti-Israeli campaigns against Israel such as BDS France, Platform of French NGOs for Palestine (PFP), Association France Palestine Solidarité (AFPS), CCFD-Terre Solidaire, la Ligue des droits de l’Homme (LDH), and Oxfam France. “The game ‘Living Palestine’: an interactive educational tool to understand the daily lives of Palestinians”: Organized by AFPS and PFP, this workshop is regularly organized by PFP. The one-sided “interactive teaching tool” “gives the opportunity to the participants [of this game] … to be confronted with the situations of waiting, the administrative dependency and the arbitrary, which ‘punctuate’ the lives of the Palestinians.” For more information, see “A pro-Palestinian association organizes a partial role play at the expense of the taxpayer” (French). AUDRIP supports a cultural and academic boycott of Israel.